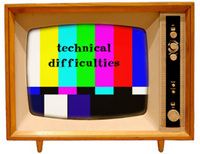 For anyone who tried to log on to Scrapbookers Bubble Bath yesterday and received an "OOPS" screen ~ please forgive me. Would you believe my VISA Check Card for my Scrapbookers Bubble Bath was stolen last week? And, as a result, lots of people got free gas compliments of.....me I guess. However, Kudos to VISA Fraud Department for catching it before I did, and, helping me to cancel the account before my card and SBB served all of Cleveland. The thing is, I knew these kids were doing something as I purchased my usual Saturday morning donuts at the grocery store. When teenagers start telling you how cute you are, you know they are up to something :) In fact, I finally said 'Come on guys, I am almost 40 years old, am the mother of 4, and, I just got out of bed'. But, they still worked some pretty quick work, and, got my card anyway. And, I forgot the fee for my websites came out of that card # ~ I wonder what my site host thought when the card came back as stolen? In fact, visit SBB soon, I am about to click over there and start working on it ~ the Lord has placed such big dreams on my heart for you, me, our scrapbooks, our legacies, and Scrapbookers Bubble Bath.